To aid, regulate and enforce a naming standard, Enterprise Architect includes some capabilities to configure the default names assigned to new elements of a specific type. This is a useful feature when dealing with complex and large sets of requirements, but is also relevant when dealing with smaller data sets. Auto Names and Counters can be used to assign a sequential number to any element type including Requirements. It includes a prefix definition, a counter and a suffix definition allowing numbers such as: 'REQ007 - Manage Inventory' to be created. Analysts and others can use the sequential number for communicating unambiguously about the requirements without having to use the often long requirement name. 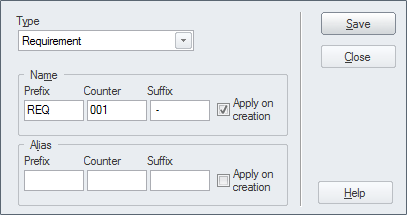 The 'Apply on Creation' option must be checked to start using the auto numbering feature, this can also be used to temporarily suspend auto naming for example if other types of requirements are being entered that don't need to have sequential numbers assigned. 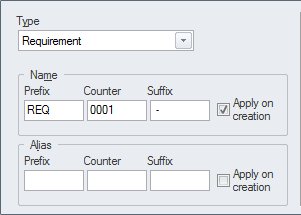 There are options to define the prefix, counter and suffix for a requirement.